The National Team Challenge 2012 held at Bracknell on 8 July was a two-horse race between Alexandra Palace and the eventual winners Guildford. Guildford set the pace early on, dropping a mere two points in five free skating events, but Alexandra Palace fielded strong dance competitors and had soon established what looked like an unassailable lead. Guildford, however, closed the gap in the exhibition events to 2.5 points just before the final, compulsory show number, with Alexandra Palace on 59 and Guildford on 56.5 points. With the next closest team, Basingstoke on 50 points, only Guildford could overtake Alexandra Palace, which they did by the narrowest of margins, edging out the north London team by just 0.5 points. Third place had an equally close battle. Isle of Wight was only 0.5 points behind Basingstoke going into the show number, and by finishing third in the show, ahead of Basingstoke in fourth, the Island slipped ahead into third place overall by just 0.5 points. It’s a good result for the Isle of Wight, who have now been on the podium at the event two years in a row. Almost all of its entrants ended up on the podium in the individual competitions with either silver or bronze medals. First place overall, however, has still eluded the team. Highlights of the event included the outstandingly funny entry from Lee Valley in the 2s, 3s and 4s any standard. Max Berry and Harry Andrews proved that the height of British comedy on ice is perhaps the sight of two burly chaps in white tutus skating to Swan Lake. Side-splitting stuff. Lee Valley also turned out an excellent show number to the Wizard of Oz, well costumed and choreographed, with some clear thinking about how to make props manageable, transportable and effective. The Isle of Wight’s moving rendition of the Lion King with magnificent carnival animal costumes was incredibly only third, but therein lies the mystery of what tickles the show number judges. Class 13, Solo exhibition level 4 and under: 1 Sophie Griffiths CHE; 2= Rosie Thomas GUI, Amy World IOW; 4 Jasmin Davis BRI; 5 Brooke Turner BRA. Entrants tied for second both score 6.5 points. Overall: 1 Guildford 63.5 points; 2 Alexandra Palace 63 points; 3 Isle of Wight 55.5 points; 4 Basingstoke 55 points; 5 Lee Valley 54 points; 6 Bracknell 50 points; 7 Chelmsford 49 points; 8 Bristol 46 points. 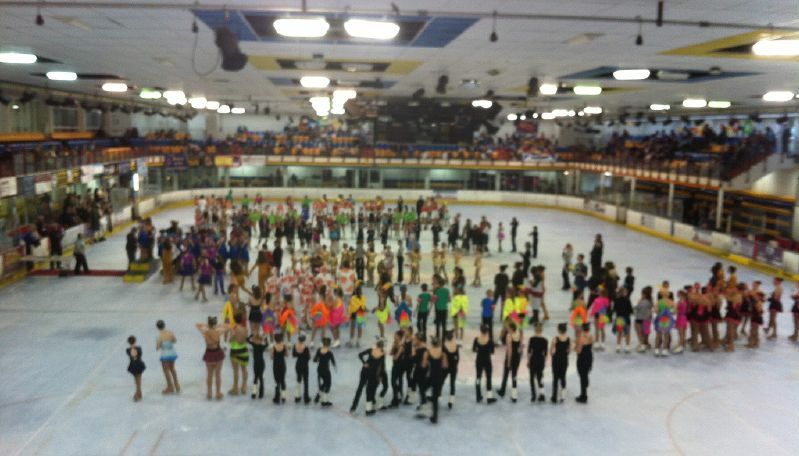 Points were scored on the basis of 8 points for 1st, 7 points for second, down to 1 point for 8th in each of the eight competition classes that a team could enter, plus the compulsory show number. The maximum possible score this year therefore was 72.